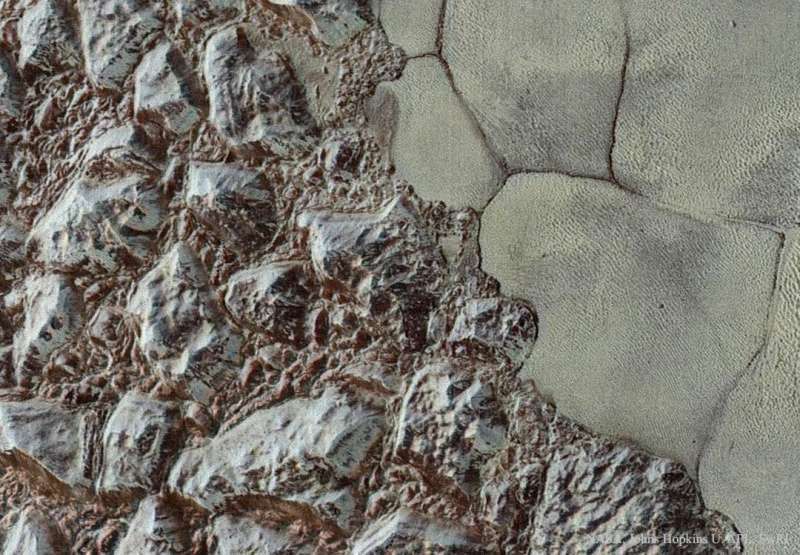 Explanation: What do the sharpest views ever of Pluto show? As the robotic New Horizons spacecraft moves into the outer Solar System, it is now sending back some of the highest resolution images from its historic encounter with Pluto in July. Featured here is one recently-received, high-resolution image. On the left is al-Idrisi Montes, mountainous highlands thought composed primarily of blocks of solid nitrogen. A sharp transitional shoreline leads to the ice plains, on the right, that compose part of the heart-shaped feature known as Sputnik Planum. Why the plains are textured with ice pits and segmented is currently unknown. The image was taken about 15 minutes before closest approach and shows an area about 30 kilometers across. The New Horizons spacecraft is next scheduled to fly past Kuiper Belt object 2014 MU 69 on New Year's Day 2019. AAS Members: How does APOD help you?